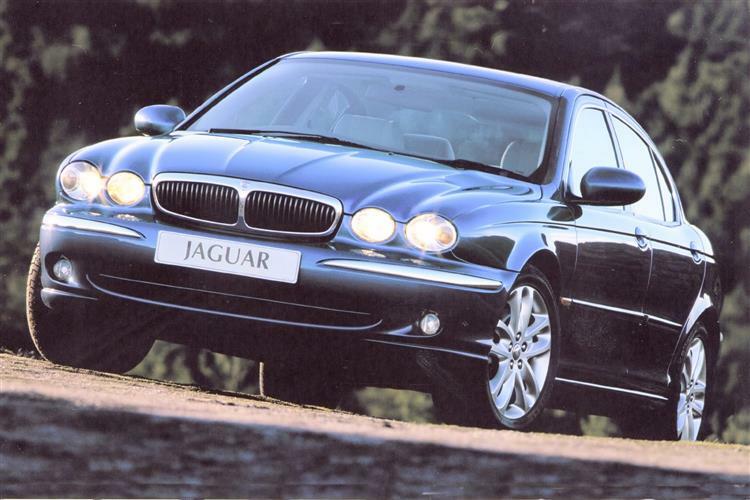 The Jaguar X-TYPE marked a series of firsts for Jaguar. It was their first all-wheel drive production car and subsequently their first front wheel drive. It was the first to challenge the hegemony built up by the BMW 3 Series and the first to be built around a mainstream Ford Mondeo platform. Old school Jaguar purists wrung their hands in abject horror whilst the rest of us recognised the machinations of Ford's Premier Auto Group at work behind the scenes and recognised the X-TYPE for what it was - pragmatism and clever engineering writ large beneath some pretty clothes. Shooting yourself in the foot with a used example would take some doing as the X-TYPE has thus far proved to be a sound proposition. 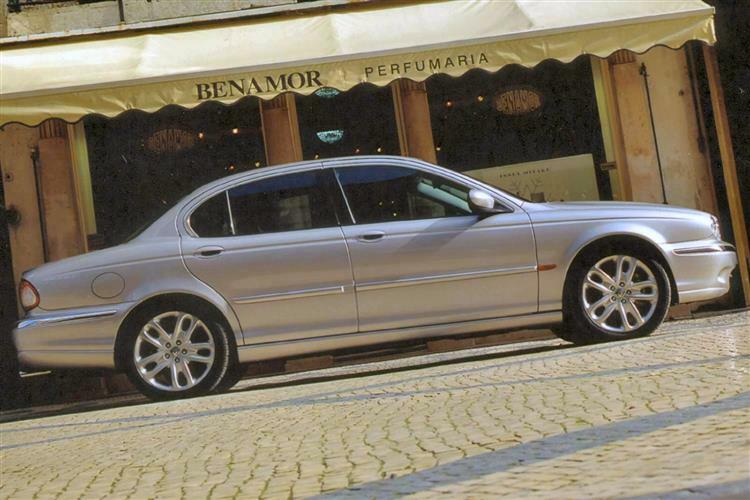 Perhaps feeling that the compact executive class was becoming a tad predictable, Jaguar's attempt to muscle in on the BMW/Mercedes/Audi party was launched in February 2001. The X-TYPE range was built on a modified Ford Mondeo chassis and featured all-wheel drive ostensibly as an engineering 'fix' to get around the front wheel-drive Mondeo layout and also as a handy marketing tool to scotch Audi's quattro USP. Two engines were made available, either a 194bhp 2.5-litre V6 or the punchy 227bhp 3.0-litre V6, each available in either base, SE or Sport trim levels. 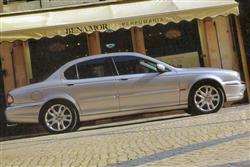 This remained the case until early 2002 when the X-TYPE 2.0-litre models were introduced. Apart from the 157bhp 2.0-litre V6 engine (which was strictly speaking a 2.1-litre lump), this model differentiated itself by junking the X-TYPE's hitherto much-lauded all-wheel drive in favour of standard issue front-wheel drive. So good was it that few noticed the loss. Estates were later introduced. Later a 2.0-litre diesel engine was added and in the autumn of 2004 the Sport Premium and Sovereign trim levels materialised. A 2.2-litre diesel was added to the range in late 2005. All models received a chrome mesh grille in spring 2007. The X-TYPE was tweaked again for the 2008 model year and although the visual changes were difficult for the layman to spot, over 500 new components were introduced. Revisions to the grille, bumpers and side mouldings altered the front end while enhanced trim materials upgraded the interior. Otherwise, there was a new 6-speed automatic gearbox for the 2.2-litre diesel. For some customers, the X-TYPE's success will be virtually guaranteed by its neat styling. The lines are reminiscent of the S-TYPE, though Jaguar's design studio has managed to pull off a clever trick. In shrinking a design, the usual effect is to make a car look squatter and stubbier, but with the X-TYPE the reverse is true. It appears even more elegantly proportioned than the S-TYPE: indeed, its frontal treatment is more like the imperious XJ8 Series. Apart from the base model, two trim levels are on offer, a clubby SE model with burr walnut cappings and chrome body addenda and a more youthful Sport edition, with sports seats, smoke-grey interior veneers and big 18-inch wheels. The 2.0-litre X-TYPE is priced close to the plusher Ford Mondeos and that near parity hides a key consideration because the X-TYPE actually rides on a modified Mondeo chassis, with around 20% of its parts shared with Ford's middleweight. Anybody who's driven the current Mondeo will welcome this as a very good foundation to build from. "Customers for the X-TYPE typically will be younger than traditional Jaguar buyers with notably different needs," says Jaguar's Managing Director. "As the smallest and most affordable model in the range, the X-TYPE challenges existing perceptions about Jaguar. The X-TYPE is also a car for the driving enthusiast." Indeed, the importance of the car to Jaguar's global aspirations cannot be understated. Worldwide, the company has sold around 85,000 cars in the last calendar year, but Ford won't be happy with anything less than 170,000 sales per annum - a doubling of world sales. With near perfect weight distribution, class-leading power outputs and the input of some of the best chassis engineers in the business, few industry observers doubt the X-TYPE's ability to meet and possibly exceed these projections. Compared to Jaguars of the past, even the most cursory inspection of the X-TYPE reveals levels of quality and engineering that the Coventry firm could never have dreamed about fifteen years ago. Despite the backup from Ford, the X-TYPE is a largely British undertaking. The interior of the X-TYPE sets new standards of quality and, indeed, modernity for Jaguar, redressing many of the grumbles that were heard at the S-TYPE launch. The fascia retains the 'plank' - a long swathe of wood running the width of the dashboard - but the major dials are housed in a modern binnacle rather than in individual recesses as in the XK8. What's particularly impressive is the way that Jaguar have managed to blend traditional touches like wood veneers and chrome cappings with modern must-haves such as multi-function LCD screens, airbags and multi-speaker audio systems. That's a tall order, and the X-TYPE manages it better than most. The cabin certainly feels more special than any of its rivals, and has premium product design cues all over it. If your last experience with a Jaguar was one of the unlovely XJ40 models from the eighties, then it may be time to reacquaint yourself with the brand. Some of the first cars were a little looser in terms of internal fit and finish than Jaguar would have cared to admit but the production experience curve soon saw to any minor niggles. In most respects there's no appreciable quality difference between an X-TYPE and a Mercedes C-Class. No significant mechanical issues have been raised, reflected by Jaguar's enviable results in recent J D Power surveys. (approx based on 2001 X-TYPE 3.0) Spares for the X-TYPE hover around the compact executive average although you won't have quite so many 'parallel' imports of pattern parts if you want to cut corners. Given the fact that pub bores may denigrate it as a Mondeo, nipping down to your local Ford dealer to pick up spares is often likely to result in a wasted journey. Front brake pads are around £45, whilst rears are £30. Expect to have to fork out around £175 for a new clutch assembly and around £485 for a new exhaust system. A replacement headlamp unit costs around £220. 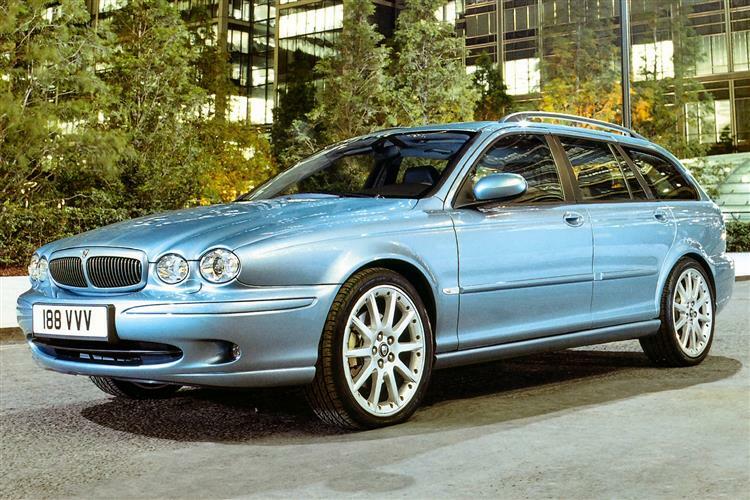 If you're after the full-on X-TYPE experience you need that 3.0-litre. Fire it up and you'll be greeted with a muted growl before it settles to a distant rumble. You'll initially feel that this is going to be a sporting drive, tilting at a 3-Series rather than a C class. Indeed, although the suspension is admirably supple in its absorption of ridges and ruts, there's not a great deal of body roll, the X-TYPE feeling taut and eager. When coupled with the automatic box it's easy to forget that 40% of the drive is directed to the front wheels. The steering takes a little getting used to. Gone is the usual Jaguar steering feel, that remote, oily slickness that distanced drivers from the road. In its place is a ZF Servotronic variabe-ratio system which seamlessly reduces the amount of assistance as speed builds. It's a great system for motorway cruising, with just the right amount of feel around the straight ahead point, but get a bit enthusiastic into the corners and the tardy turn-in and odd feeling that you need to turn the wheel far more than is at first expected will take some getting used to. Likewise, the automatic gearbox, even when switched into sport mode, can't really keep up with the demands of being pitched through a series of twisty bits. Still, that's what Jaguar makes the X-TYPE Sport for. The chubby windscreen pillars restrict visibility through tighter bends, but otherwise the Jaguar is a genuinely impressive packaging job. For a British car it adopts a groundbreaking competence in ergonomics, with all switches, minor controls and access points being intuitive to operate. Rear legroom isn't the best, especially if there are long-legged drivers up front, but that's par for the course in this class. What isn't is the enormous boot, 452 litres being a Jaguar record. Get a bit brutal with the right hand pedal and, with a 3.0-litre underneath you, you'll despatch 60mph in 6.9 seconds, the X-TYPE launching off the line without drama whilst making a strident high-pitched yelp as the gearbox hangs onto each gear, peak power arriving at a stratospheric 6800rpm. The 231bhp engine will punch the car up to 143mph, although this sort of driving won't get you near Jaguar's combined fuel consumption figure of 27mpg. Despite it's stiff, no-nonsense chassis feel and tight suspension, the luxury accoutrements and unwilling steering and transmission of the SE version don't encourage press-on driving, all of which make the Sport variant a far more satisfying model. The 2.5-litre is less satisfying for the keen driver, with the 2.0-litre being surprisingly zippy, able to hit 60mph in 8.9 seconds and keep going until 130mph. Buyers of used Jaguars have traditionally needed some sort of homespun, emotional response when questioned about their purchase. The heritage, the looks, the badge - all reasons as valid as any other but reasons which the X-TYPE keeps in its toolbox rather than acting as the tools of its trade. This is a car that has layers, textures and subtleties to its talents, a Jaguar that needs no preamble. It's up there with the best in the class. Just don't expect a bargain.